Japan women's soccer: Will the allure of business class upgrades motivate Japan to win gold? Will the Allure of Business Class Upgrades Motivate Japan’s Women’s Soccer Team To Win Gold? Japan celebrates beating Canada in its first Olympic match on Wednesday. 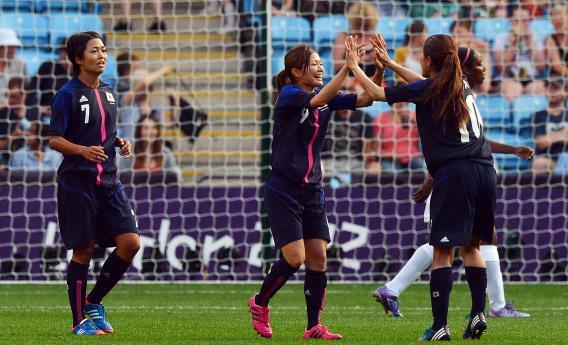 The defending Women’s World Cup champions from Japan won their Olympic opener today against Canada 2-1. The Japanese soccer team showed no ill effects from their 13-hour flight to Europe, where they were bunched into the plane’s “premium economy” section. Japan’s less-storied, non-World Cup-winning men’s team, meanwhile, flew business class at much greater expense. “I guess it should have been the other way around,” women’s team captain Homare Sawa told the Japanese press. It’s not just the Japanese who practice Olympic air-travel discrimination. Australia’s men’s basketball team likewise enjoyed the comforts of business class on its way to London while the women’s team flew in the back. As with the Japanese soccer teams, the Australian women have been more successful than the men on the court, winning three straight silver medals in basketball. Basketball Australia has said it is reviewing its Olympic travel policy. The Japanese Football Association, however, has defended its airborne sexism, stating that the men’s soccer team must fly business class because it’s stipulated in the players’ professional contracts. “The women’s game doesn’t have those conditions yet,” explained a Japanese Football Association media officer. “Also, body size does come into the equation,” the official added. There is hope for Japan’s women’s team—the Japan Football Association is dangling the possibility of upgrading the players to business class if they take home the gold. After winning last year’s World Cup, bringing joy to a country still recovering from the Fukushima disaster, the team was bumped up to business on its return from Germany. “I hope we can produce a good result again and be treated the same way,” Sawa said last week. What would an upgrade from economy to business mean for the Japanese women? According to sample menus from Japan Airlines, a move to business would allow Sawa and her cohort to choose from a “selection of nine seasonal colorful delicacies in ‘Kobachi’ bowls—exquisite tastes, hues, and freshness of the season.” In economy, by contrast, they would pick between hamburger steak and braised chicken. A business upgrade would also include significantly more leg room, a “laptop battery lending service,” and a complimentary cardigan. Even taking into account the appeal of a quality cardigan, this is a strange motivational technique. Is airplane seat status such a big deal in Japan that it would induce the women’s soccer team to play even harder than usual? Leave your expert knowledge of Japanese travel culture in the comments.